Posted on: October 29, 2018 By: Christopher Brown, Esq. An employment contract should give precise definitions to all essential terms and conditions of the relationship between the employer and the employee. It may also include things like pay rate, retirement options, benefits, stock options, severance, termination policies, etc. It is also possible that your employment contract will include a non-competition and non-disclosure clause. Employers place these in their contracts in order to address issues relating to confidential information and acts beyond the scope of the employment itself. These are used by the employer to attempt to limit the types of entities for which the employee may work when the current employment relationship comes to an end. The employer is trying to protect proprietary material and trade secrets that you may learn throughout your employment, and prevent you from engaging in specific types of work or disclosing corporate methods or formulas to other companies in the same field. 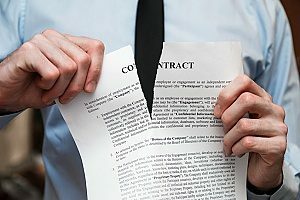 A breach of employment contract can potentially lead to damage lawsuits depending on the clause that has been breached. A breach of employment contract can happen by the employer or the employee. For example, an employer can breach the employment contract if they fail to provide you with all of the benefits you were promised in the contract. This could also include things like not paying you as much as the contract stated, or not allowing you to have all of the vacation days outlined in your contract. When an employee breaches an employment contract, it is usually because they violated the non-compete clause. This could include things like encouraging your clients to follow you to another company, or sharing trade secrets, marketing strategies, and client lists with your new company. When breaches of contract, unfortunately, do happen, they can be very complex and may place your employability and livelihood at risk pending the resolution of the matter. For more information about what constitutes a breach of employment contract and if your potential case applies, reach out to an employment law defense attorney. If you are the target of formal or informal allegations of a breach of employment contract, then the first thing you should do is seek legal counsel from an Employment Law Defense Attorney. Employment contracts are often extremely complex, and whether you did, in fact, breach the contract or not can come down to the smallest detail, which is why you should have a seasoned employment law defense attorney reviewing your case. Even if threats of enforcement action have yet to be raised against you, it’s always a good idea to be aware of your responsibilities and your rights. Once allegations have been made against you, consulting an Employment Law Defense Attorney as quickly as possible is the best thing you can do to help the situation get resolved. While it’s never too late to bring in an attorney, the assistance they can provide you at the start of your case can be invaluable. If you believe your employer has breached your employment contract, you can also have an Employment Law Defense Attorney carefully review your contract to see if you have a case or not. They can also simply offer to provide you with a better understanding of your employment contract. Having the assistance of an employment law defense attorney from the very beginning can make a huge impact in your breach of employment contract case. They will be able to break down the realistic outcomes for your unique case if you chose to pursue a lawsuit. They will be able to guide you through the process of filing your lawsuit to ensure that no mistakes are made. After this, they will work with you to help build the strongest case possible. Because of their expert knowledge and background, they can be a key part of the discovery process when making sure that all of the right documents are not only submitted but that they are also requested from the opposing party. You can provide them with all of the paperwork that pertains to the case, and they will be able to sort through it and tell you what is most relevant. Should you have to face interrogatories or questioning by the other party, they can work with you on how you should handle the situation. They can also assist if any deposition process is required for the case. They will ensure that you are well prepared for the deposition and that you are able to give an honest and effective answer to any question. They will also advise you on how to properly object to any questions that may hinder your rights. Having your own set of questions for the imposing party can be extremely beneficial, and your attorney will be more than happy to help you come up with relevant ones. If you are concerned about sensitive information being made public, your attorney can draft protective orders to be submitted to the court to protect things like medical, military, and security position information.